Deontay Wilder and Luis Ortiz have both looked very impressive, but against mostly unimpressive competition. Together they have a combined record of 67-0 with 62 KOs. But each man has faced a single opponent ranked inside of the top 10. Wilder captured the WBC heavyweight strap in January 2015 from Bermane Stiverne via unanimous decision. That’s a solid win. That it remains the best Wilder has notched in 39 fights says a lot about the poor quality of his resume. Ortiz looked sensational when he stopped Bryant Jennings in Round 7 December 2015. Again, a very solid win. But hardly the sort that lands one in the Hall of Fame. If Wilder and Ortiz had fought in 2016, I would have picked Ortiz with little reservation. But two full years have gone by now–and those case be long years for a fighter who is now 38. Ortiz dominated Malik Scott in November 2016, but was unable to cut the ring off and finish him. He’s fought two meaningless, stay-busy fights since that bout. It is tough to tell how much better Wilder has gotten since defeating Stiverne. Artur Szpilka and Gerald Washington gave him competitive rounds, but in both cases Wilder’s power ended things quickly once he found his range. At 32, he is still relatively young for a heavyweight. Wilder has shown a bad habit to let loose with wild, flailing punches. His heavy hands have intimidated previous opponents, sending them ducking for cover rather than staying calm and in range to counter. That is much less likely to happen against a veteran like Ortiz, who has an elite amateur background. Ortiz is an explosive counter puncher and lands in crisp combinations. Wilder has never faced a challenge anything like this. But Wilder will enjoy significant advantages when it comes to speed and explosive athleticism. If he can work with some degree of discipline from in back of his jab–which is not a good punch when he uses it–he could finish Ortiz off in a hurry. I have a hard time believing that this fight will go the distance. 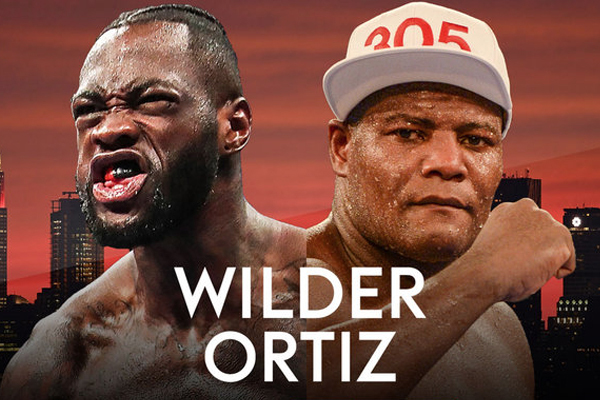 I can see Wilder ending it within four rounds, if Ortiz comes out looking flat-footed and old. This is a fight that could finally earn Wilder the respect he craves. But I’m not prepared to change horses just yet. I was ring-side for Ortiz’s destruction of Jennings and that night felt like I was watching the future Heavyweight Champion of the World. Wilder is a more dangerous opponent, but still has flaws that the cagey Ortiz should be able to exploit. I predict Ortiz will hammer his body and break him down, setting up a Round 7 KO.